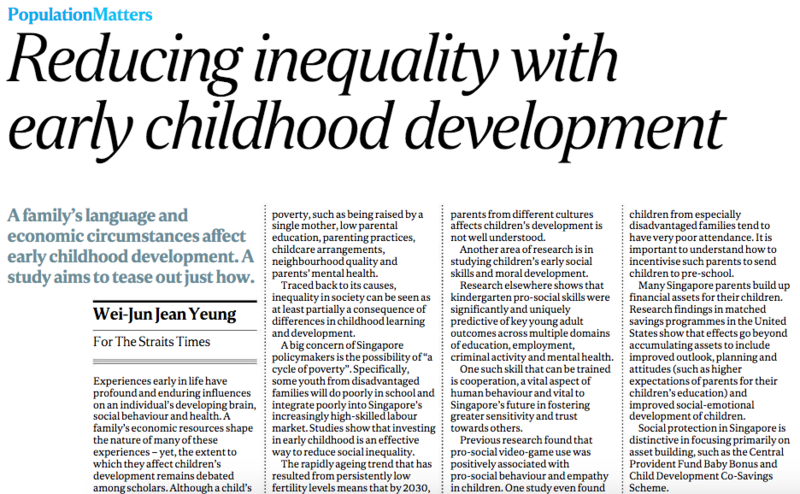 “The Singapore Longitudinal Early Development Study, funded by the Ministry of Education, will use different methods to understand the factors that may promote or impede children’s early development” (Reducing Inequality with Early Childhood Development, Wei-Jun Jean Yeung). Given that existing studies focused on early childhood development in Singapore have been cross-sectional (that is, data analysis based on observations at a specific time point) and have relied on smaller samples (usually in the hundreds), the longitudinal and large-scale national study launched by the Centre for Family and Population Research (CFPR) – which will also explore a broad range of factors, including “family resources and relations, parenting attitudes and practices, social support, childcare arrangement, and government policies” (ST, Oct. 18) – will be a much-needed research contribution. This is especially pertinent for public discourse and for policymaking, given the persistent discussions about the country’s inequality and class divide problems. Three questions, however, speak to the long-term applicability of the findings, and how other endeavours may build upon CFPR’s study. The first relates to the two waves of the core panel survey, and – given that family, community, and government circumstances and characteristics are generally correlated with the development of an individual – whether the survey could be extended to include more waves as the sampled children age, to test whether the hypothesised factors and conditions are consistent across adolescence and young adulthood. Relatedly, the second question is concerned with how the domains of early childhood development (that is, behaviour, brain, and health) as well as the environment the child is situated in (that is, community, family, government, and pre-school) are measured. Would it, for instance, be feasible to gather perspectives from stakeholders outside of the family or household alone? What is the reliability associated with views from parents and children, or how should their social support systems be evaluated? And third, how should a sustainable corpus of academic research be built around the themes of early childhood development, social stratification, and inter-generational mobility in Singapore? In addition to the aforementioned expansion of this two-wave study to track respondents across their life-cycle and the involvement of other respondents who interact with or habit the domains and environment for human development, the CFPR study should inspire more large-scale collaborations, perhaps to the extent of organising and sharing – after taking the necessary precautions to safeguard the privacy and confidentiality of the study participants, and introducing restricted-use data contracts – the data as a public-use secondary dataset, for other researchers to study questions too.